Below are 10 email subject line tips that boost your open rates. 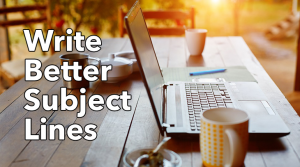 When writing your subject line, your goal isn’t to cram all the tips below into each subject line like a Sloppy Joe. (Remember those messy sandwiches from your childhood? They were okay, but not everyday!) The idea is to sprinkle these techniques around – mix and match them. When my wife and I visited the small village of Arles in the South of France there was a small café we loved going to every day called Le Monde De Sophie. Every day they had a new and surprising selection of sandwiches. What made them so good was each sandwich only had a couple of key ingredients, but the way they were blended was delicious. Sometimes it was brie, honey, and apples. Other times it was goat cheese, walnuts, and sage. The combos were simple, but always kept us on our feet for new delights. Think of your subject lines the same way. Surprise your reader. Keep it fresh. Having a hard time coming up with a good subject line? Often it’s easer to write your email first, then find your subject line buried within the text. You may be surprised how easy it is to find a phrase that pops right out that captures the whole email message in a short, compelling way. Create a unique email account with Gmail or Yahoo that you’ll only use for subscribing to other people’s lists. Create a rule in your email system that all emails coming from your new, unique email goes directly into a special folder. (I call mine “Copy Swipe Folder”.) This way you don’t clutter your inbox. Use your new email to subscribe to people and businesses you like and/or who you know are great copywriters. Over time, you’ll collect a folder filled with great copywriting examples. The next time you need to write an email and subject line, you’ll have a vast resource of ideas and inspiration. 35% of email recipients open email based on the subject line alone. (Source: Hubspot). If your #1 goal is to get readers to open your email, the best way to do this is to pique their curiosity in your subject line. Make it so irresistible and compelling that your audience HAS to see what’s inside. Another trick is to think of your email as a story and your subject line is like the hook. Your inbox gets clogged and flooded, right? You just want to get through it and clear it out as fast as possible. So what do you do? If you’re like me, you quickly delete the emails you know are trying to sell you something (or emails you know are from a company). What emails do you always open? I imagine you open the ones from friends you know – or that sound like they are from someone you know. If you see an email Where Every First Letter Is Capitalized You Know It’s Not From A Friend. So why not write your subject line (and your whole email) like you would a real friend in real life? Take this challenge: the next mass email you write, picture a genuine friend of yours and write the email just like you would to that ONE friend. Write the subject line like you normally would to a good friend. To get an idea of how you write subject lines to friends, look in your send folder. Notice how you naturally write when it’s to someone you know well. Notice the difference? Your tone will dramatically improve… and very likely, you’ll see an uptick in open rates and responses. The webinar you requested is ready…are you? If your email topic is time sensitive, say so in the subject line. Be careful not to make it hype-y. It’s got to have real urgency… and try to personalize it when you can. Again, think of how you would tell a friend about something really cool you discovered that has a deadline. Write like that. Use numbers. Use stats. Be exact. You’ll find that if you have a specific number related to your email message, there’s usually a story behind that number. Use your subject line to spark the reader’s interest and initiate a compelling story, which you’ll tell in your email. 40% of emails are being opened on mobile first where email subject lines will get cut off if they are too long. But you’re in luck because short subject lines go hand in hand with piquing curiosity. Have fun with this one! Action verbs lend themselves to action and good storytelling. Tip #7: Ask a compelling question? This is an easy, no-brainer tip that will boost your open rate. Simply present your subject line as an open-ended, curiosity-building question. This tip works especially well if you know your audience, because you can ask questions they are already thinking in their heads. For example, think about your ideal client. Picture them talking with their spouse or a best friend over coffee. It’s a deep, heart-to-heart conversation where they are sharing their true feelings and concerns. What kinds of questions are they asking their loved one to help seek answers? Like all these tips, don’t overdo this one. But if it suits your personality and you can get away with it, why not add some humor to your subject lines? Don’t overdo this one either because people will start to realize over time your emails aren’t really personalized. Again, think about how you write your friends – you might add their first name… sometimes. You can personalize by coding their first name in or simply using “you” and “your”. Nothing is set in stone with subject lines. Rules are meant to be broken, so have some fun with formatting your subject lines in creative ways. They’ll stand out. Use (parenthesis) or [brackets] for highlight. See what your audience responds to over time. What do they seem to like? Or dislike? Adjust your copy accordingly. Chances are you can be more creative and relaxed than you are being now when writing your emails and subject lines. I encourage you to be yourself. Your audience is hungry for authentic connections. If you let your personality shine, chances are you’ll see higher open rates. Use these tips to inspire and guide you, but feel free to break the rules, too–as long as you see a positive response from your audience. However, there may be some exaggeration as to your statement ‘9 times out of 10 it is the subject line’. Maybe the truth is somewhere in the middle.